View images from the book. On dry land, most organisms are confined to the surface, or at most to altitudes of a hundred meters—the height of the tallest trees. In the oceans, though, living space has both vertical and horizontal dimensions: with an average depth of 3800 meters, the oceans offer 99% of the space on Earth where life can develop. And the deep sea, which has been immersed in total darkness since the dawn of time, occupies 85% of ocean space, forming the planet’s largest habitat. Yet these depths abound with mystery. The deep sea is mostly uncharted—only about 5 percent of the seafloor has been mapped with any reasonable degree of detail—and we know very little about the creatures that call it home. Current estimates about the number of species yet to be found vary between ten and thirty million. The deep sea no longer has anything to prove; it is without doubt Earth’s largest reservoir of life. Combining the latest scientific discoveries with astonishing color imagery, The Deep takes readers on a voyage into the darkest realms of the ocean. Revealing nature’s oddest and most mesmerizing creatures in crystalline detail, The Deep features more than two hundred color photographs of terrifying sea monsters, living fossils, and ethereal bioluminescent creatures, some photographed here for the very first time. Accompanying these breathtaking photographs are contributions from some of the world’s most respected researchers that examine the biology of deep-sea organisms, the ecology of deep-sea habitats, and the history of deep-sea exploration. An unforgettable visual and scientific tour of the teeming abyss, The Deep celebrates the incredible diversity of life on Earth and will captivate anyone intrigued by the unseen—and unimaginable—creatures of the deep sea. "In the first century A.D., Pliny the Elder—in a bout of oceanic hubris—pronounced that there were precisely 176 species of marine fauna and that, ’by Hercules, in the ocean . . . nothing exists which is unknown for us.’ Would that we could summon Pliny from his celestial Hall of Shame and thwack him over the head with Claire Nouvian’s The Deep: The Extraordinary Creatures of the Abyss. For this book contains 220 color plates of life-forms whose existence was unknown not merely to Pliny but to anyone at all until the modern development of submersibles capable of plunging to depths that are the inverse of a Mount Everest. Only 5% of the seafloor has been mapped, and scientists estimate that there are between 10 million and 30 million species in the ’vasty deep’ yet to be found by man. The ones that we do know—and many of those are pictured in this book—are gloriously bizarre critters that appear to have been fashioned by Salvador Dali. They bear pulse-quickening names that are as if from some weird children’s fable: naked sea butterflies, spookfish, pigbutt worms, cutthroat eels, helmet jellies, glasshead grenadiers and yeti crabs. Hued in pink, red, blue, orange, white and purple, these deep-sea denizens can seem repulsive, with their fangs and hooks and hooded eyes. Many of them, however, are balletic little beauties—bioluminescent, geometrical designs that hum with a life beyond our reach, but not, anymore, beyond our imagination. " "Many beautiful coffee-table books celebrate the world’s oceans...but few, if any, are dedicated to the life of the ocean’s deeps, which most of us will never see otherwise. Readers will pick up science journalist Nouvian’s book for its stunning, 200-plus full-page color photographs of dumbo octopi, vampire squid, frilled sharks, and hydrothermal vent worms; they will hang on to it for the well-written, extremely informative text. Extensive captions speak to each creature’s lifestyle and habitat, while short guest chapters by eminent scientists and Nouvian’s additional text provide background information on the deep ocean and its exploration." "A luminous voyage to the bottom of the sea. . . . Each of the 200-odd photographs in this book is in color. Bejeweled creatures—squid, comb jellies, octopuses, and tube worms—leap off the black pages in such a luminescent rainbow that you can’t help but realize that the ’blackness’ of the depths is a misnomer. In many case, photographs of these organisms appear in this book for the first time anywhere. . . . Such intimate photographs are surely the book’s triumph. But an articulate and informative commentary accompanies them." "Outstanding images of deep-sea life drape the pages of The Deep. Inevitably these include the fish that can, in the words of deep-sea pioneer William Beebe, ’outdragon’ any figment of human imagination. Equally welcome is the showing this book gives to invertebrates. My favourite is the giant isopod Bathynomus, whose alien face looms out at us. This visual feast is accompanied by equally evocative essays from deep-sea biologists: Cindy Van Dover, director of Duke University’s marine lab in North Carolina, narrates a history of deep-sea exploration, for example, while Craig Young, director of the Oregon Institute of Marine Biology, describes the scale of the ocean floor. Words and images combine to convey what we know—and how much we don’t know—about life in our planet’s largest habitat." "This superbly designed large-format book of photographs of deep-sea creatures, eloquently edited by a French journalist and film director, with brief and highly readable contributions from sixteen leading scientific explorers of the deep, is eye-poppingly magnificent. So much so that it provokes gasps of amazement and awe at the complexity, beauty and uniqueness of life in the abyss. One frequently finds oneself wondering whether the weird creatures floating in the darkness like visiting space aliens can really exist—except in the minds of special-effects artists. . . . Easily in the same visual league as the BBC’s series Planet Earth, The Deep provides a lot more knowledge than the television series for those who want it, without at any point overwhelming the non-biologist reader. . . .The Deep deserves to become a modern classic of natural history." "Nouvian’s The Deep features more than 200 color portraits of the planet’s least-known creatures: sparkling pink octopi like floating lanterns; iridescent squid with corkscrew tails; predatory fish with hooded eyes and translucent teeth looming in the darkness. Some of these are the first-ever photographs of certain organisms. At least eight of the pictures feature animals so unknown that Nouvian’s captions list them as ’unidentified.’ To page through her book is to feel as if you are peering at life on another planet: It is a vision of the deep as a vast, balletic swarm of nature’s inventiveness." "Bizarre species from as far down as four and half miles are shown in remarkable detail, their tentacles lashing, eyes bulging, lights flashing. The eerie translucence of many of the gelatinous creatures seems to defy common sense. They seem to be living water. On page after page, it is as if aliens had descended from another world to amaze and delight. A small octopus looks like a child’s squeeze toy. A seadevil looks like something out of a bad dream. A Ping-Pong tree sponge rivals artwork that might be seen in an upscale gallery. Interspersed among 220 color photographs are essays by some of the world’s top experts on deep-sea life that reflect on what lies beneath." "Each squid, jellyfish, and deepsea worm is posed in all its baroque extravagance against a stark black background, occupying a full or double-page spread. The effect is startling, like a series of underwater mug shots crafted by Fabergé. Ms. Nouvian ... has enlisted 15 scientists from such research institutes as the Smithsonian, Woods Hole, and the Monterey Bay Aquarium itself, to contribute brief but lively reports on everything from ’sharks of the dark’ to methane seeps and hydrothermal vents. There is a handy depth chart keyed to each image, a glossary, a page of interesting oceanic statistics, and a good bibliography.Good as the texts and aids are, the images carry the book; they are simply spectacular." 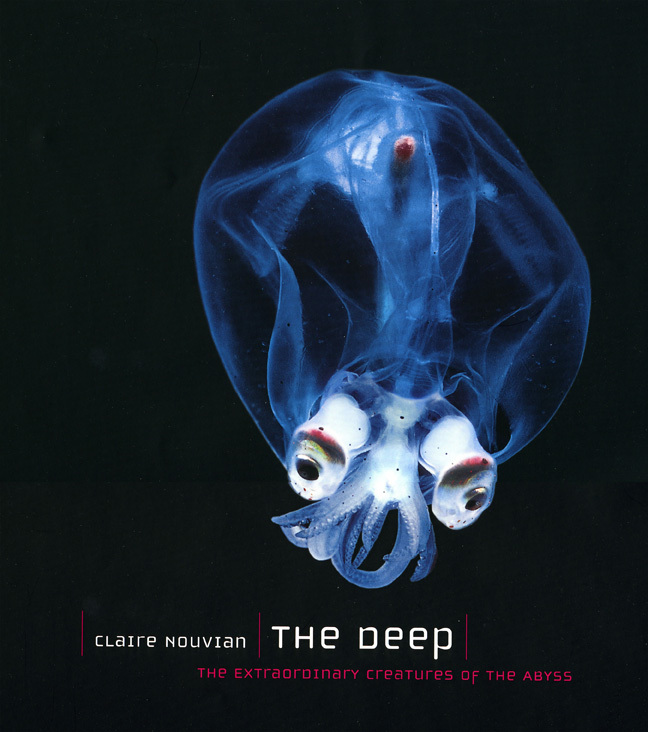 "No photo collection could replicate a visit to their realm or the breadth of the diversity to be found there, but Claire Nouvian’s The Deep, with more than 200 large-format photos, comes closer than any previous book....The Deep offers spectacular views of such marvels as bioluminescent dragonfishes and a googly-eyed glass squid. Other animals have less colourful names, but are exquisitely beautiful. It is difficult to imagine anyone who would not be enchanted by the creatures on display. . . . The deep’s creatures are beautiful, bizarre and at times even grotesque enough to capture attention without any fashion photography. This wealth of photos just needed to be made available; in doing so, Nouvian has done both the field and the public a service." "Here is a book that does justice to this amazing environment and its inhabitants. The text is written by oceanographers from marine institutions across the globe. They have supplied short, readable introductions to their areas of interest, packed with bites of breathtaking information. Stunning underwater photographs are given full pages or spreads in this large-format hardback book to reveal all their glorious detail—each caption clearly stating the animals’ actual size to put them into context. Another helpful feature is the scale on the bookflap that matches up to a mark on each photo, showing the maximum depth at which each species is found." "’Don’t give away that book!’ so exclaimed my 12-year-old daughter. . . . Since arriving, The Deep has been sitting on my coffee table, thumbed through by kifs and adults alike. I sat down and read it cover to cover." "The Deep demonstrate that some of the weirdest, most wonderful creatures may well remain undiscovered. For the past 25 years, one new deep-sea species — from the neon-colored to the nearly invisible — has been found each week. Estimates of those remaining undiscovered range from 10 million to 30 million. By the time all those creatures are cataloged, they may well have beggared the capacity of human language to describe them. The Deep already showcases a circus menagerie that includes the ping pong tree sponge, the fangtooth, the red paper lantern medusa, the glowing sucker octopus, the vampire squid — for whom the expression "bat out of hell" would seem to have been invented— and the pigbutt worm ("a pair of flying buttocks"). Hailed when it was released in March, The Deep features 160 photos and 15 essays by deep-sea biologists. The Earth — or at least the wildly extravagant oceans that constitute our largest ecosystem — can still be wondrous strange, stranger than anything science fiction has imagined." “Claire Nouvian’s wondrous book The Deep contains the finest collection of photographs of the denizens of the deep that I know of." "The brilliant photography conveys the mix of beauty, mystery, and nightmare in these creatures . . . all backed up with excellent essays from the world’s top marine biologists." "Did you know that only about 5 percent of the deep-sea floor has been mapped in any detail? Absolutely astonishing photos of the species living in those ground-floor apartments. Gives new meaning to the phrase ’I’m not going there.’"
"An excellent resource for high school science teachers (or English teachers looking for informative non-fiction reading material)." "This is the volume that many of us who have spent our lives exploring the deep sea have longed to have adorn our coffee table. The images throughout this large, pictorial book are simply breathtaking. They represent a collection of some of the finest images ever taken in the depths of the ocean by researchers throughout the world ... The book inspires awe and is worthy of occupying a special place in anyone’s home or office." "In The Deep, journalist Claire Nouvian has assembled a portrait gallery of these exotic creatures, accompanied by eloquent essays by more than a dozen ocean scientists. The denizens of the deep are so bizarre they seem to have been sculpted by Salvador Dalí on acid. Fish with skeletal heads and protruding fangs glower into the camera, some with lower teeth so long that a reckless bite could take out their own eyeballs. Smooth-skinned octopuses float in the blackness, resembling embryos attached to bundles of wormlike tentacles. Other creatures look like ball-point pens, paper lanterns, baby’s buttocks, and Pokémon cartoon figures, while the spooky vampire squid reminded me of a bat’s head grafted onto the webbed foot of a duck." "Astounding. . . The Deep is far more than an exploration of these strange ecosystems. It is a remarkable visual tour through the entire deep ocean. . . . The images astonish. Set against the inky black of the deep, a glowing sucker octopus Stauroteuthis syrtensis leaps from the page, a pink ballerina complete with a fairy-light display. A gelatinous siphonophore, a type of colonial jellyfish, releases a dazzling lightshow of bioluminescence from its toxic tentacles. Tiburonia granrojo, known to the submersible pilots as “big red”, an incongruous, metre-wide velvet mushroom-like jelly hangs in the black, dimensionless deep." "This book presents creatures living at mid-sea to ocean deep in all their gelatinous glory of color, lights, tendrils, and other adaptive appendages. More than a memory book of images of the deep, The Deep introduces the reader to research questions driving expert oceanographic researchers to exotic deep-sea locations. . . . A wonderful resource for almost any library, nature lover, and oceanographer, this book is a classic in the making." "No amount of explanation can do justice to thes images. Go down to your local bookstore and leaf through a copy to get the full effect. Once you’ve been antranced by the bizarre and wonderful creatures you will be eager to learn about them and their world. This is the perfect gift for anyone from a serious undersea enthusiast to someone who likes to look at pictures of wacky things."